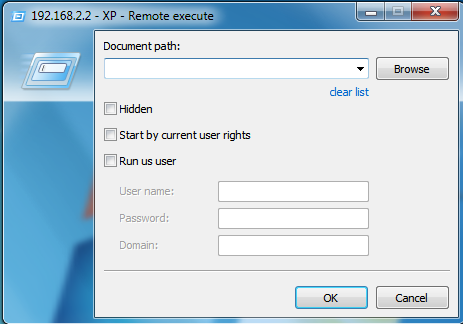 This mode allows you to run applications on the remote computer. This function is similar to the Run system command. Additional parameters include: Hide option, which allows you to run an application in the hidden mode, Run with the current user rights and Run with the rights of the user you specified. By default, the application will run as a remote server, but if the server works as a service, then it will run with the system privileges. Press Add current path button to add it in bookmark list.